Sirocco proudly distributes the Williams Jet Tender range from the UK. These are the world’s leading jet tenders and are universally respected by luxury boat owners and fun loving boaters alike. 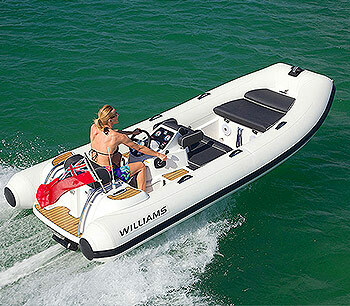 No inflatable boat performs quite like a Williams jet tender. Powered by engines including German made Webber turbocharged engines, even the larger Williams models can accelerate from standstill to 40 knots in a matter of seconds. With 98 horsepower (70 kW) at your disposal, Williams Jet Tenders perform like no other inflatable boat you’ve ever experienced. Since they’re rigid inflatable boats with all the benefits of a solid fibreglass hull, they have the precise handling capabilities and agile performance you need to manage all that performance. 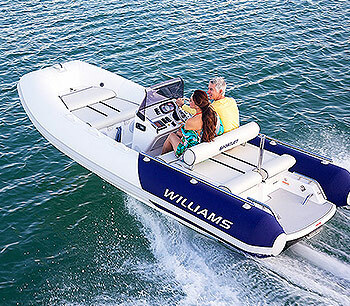 As a tender to take you ashore in remote bays, there’s nothing like a Williams. Since the jet propulsion unit has a low draft, you can confidently take a Williams inflatable boat across shallow waters. 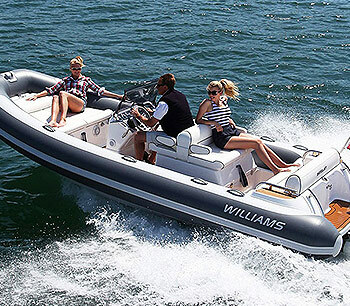 So if you’ve been looking at other inflatable boats for sale, then look through the Williams Jet Tender range, you’ll find nothing comes close for high quality and high performance.